Currently the world releases 4.9 metric tons per-capita of carbon dioxide emissions annually. There is only 31% of land available in this planet which is covered with forest. Therefore if you are thinking to make your office go green, the time is right now. Eco experts are of the opinion that when you are planning to make your office eco-friendly, you should understand that this should be an ongoing project and not a project which is undertaken for a specific duration only. It is also essential that apart from you, all the other members of the office should be enthusiastic and be motivated to participate to make the office green . 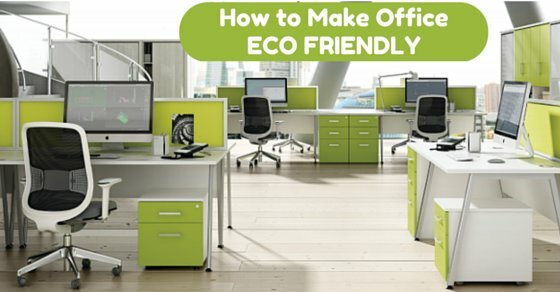 Below we have discussed a few fine points using which you can make your office more eco friendly office than before. To become eco friendly is one of the ways to save the earth and keep the earth green. The following mentioned are few go green tips on creating a eco friendly environment or earth friendly work environment and ways on how to be eco friendly. Do you really need to invest in the specific service or product? Is there any other product which is eco-friendly and can be used in its place? Would the product be useful even after it has been used? In 2014 according to the data shared by EIA or U.S. Energy Information- Administration, around 412 billion kilowatt hours has been consumed by the residential and commercial sectors. This emphasizes the fact that large amount of natural resources is being used up annually. You can make a difference by monitoring your office electricity expenditure in a major way. Here you can shut off your computers during lunch time, switch off the light in a room when it is not be used and switch the AC off for a few minutes when the room is cool. Another trick to save electricity is setting all the electrical equipments in their energy efficient settings mode. When designing the office, large amounts of natural lights should enter the office rooms during the day. This simple strategy would also minimize the use of artificial lights in your office and save money as well. Did you know that an average office worker uses around ten thousand copy paper annually? USA consumes nearly 30% of the total world’s paper consumption. Your office can make a difference like Bank of America which has attempted to consume 25% less paper annually, as they encouraged people to use online forms more for their various banking procedures. A simple method can be implemented where both the sides of a paper can be used for printing important documents and recycled paper can be used as office stationary. Here you would also be benefited if you and your office colleagues share important office paper files, rather than making several copies of them. If the documents are important you can use cloud services and share them with the important people only. Most people have the impression that eco friendly products are expensive. But these eco products cost only 5% more than the normal products. Therefore when you invest in them, you are contributing to make the planet a better place to live for the future generations. You can start by investing in cartridges which can be refilled, highlighters which are made from non-toxic or eco friendly materials and of course using recyclable paper. Today there are many websites which would provide you with all the informations you would need regarding these environment friendly products. According to the studies undertaken by the National Center for Health-Statistics in USA, one out of three Americans suffers from asthma and allergy problems. One of the factors contributing to this problem is the presence of large amount of chemicals in detergents and soaps. You can request your office cleaning services company to use eco green products like Ecover, Pink Solution or Nature Clean. Natural or eco friendly cleaning products like Baking Soda, Lemon and White Vinegar can also be used in your office. Minimize the use of air freshener in your office by placing small potted plants around the office. You can also place dry herbs in a few small bowls around the office and this simple technique would make your office smell fresh all day long. More people around the world are using organic food in their daily life. Currently the market for organic food in USA has grown to $24.4 billion dollars and people are willing to pay a few extra dollars more, if they can enjoy premium organic food. Here you can take the go green initiative and request people to reduce their meat intake during lunch at office. Also during office sponsored lunches you can go vegan also. When you are trying to make your office eco-friendly, your long term mission would be to make your office paperless. This would be a difficult project to undertake but initially you could start by using as much less paper for printing official documents. Here you could encourage storing online files in a more secure manner and reading them there as well. When you wear official formal suits in summers, you feel hot and humid. Here you tend to use more AC and then needed. Thus introduce the dress code to be casual during summer and then you can switch your heavy duty AC’s off. When selecting an appliance for your kitchen, you would need to check their energy ratings which would ensure that they consume as much less electricity as possible. When making tea in an electric kettle use small amounts of water. This would minimize the electricity level being used, and also save water. Also use simple bins for collecting traditional wastes and separate bins for wastes which can be sent for recycling. Implementing the above office ideas would take time and you need to be patient. However once they are implemented slowly, you and your other office members would contribute to make the Earth a better place to live in, the coming future days and this would thus make you all happy and contented.